Mark Zuehlke joined the Oshkosh YMCA 2½ years ago after losing his wife to a very rare type of cancer. Mark’s friends in a men’s grievance group encouraged him to join his local Y knowing that it would help him meet new people and get him back into a routine. As a child growing up in the city of Oshkosh, Mark visited the Y frequently for swimming lessons and other activities. When his two daughters were old enough, they became involved with YMCA programs, participating in swimming lessons and attending Camp Winni-Y-Co. Since joining the Y himself, Mark has volunteered for various fundraisers that help support the Oshkosh YMCA’s Annual Campaign. He truly goes above and beyond, contributing countless hours to the Y throughout the year. For the last 3 summers, Mark has helped at EAA AirVenture working the YMCA Beverage Carts. He has also volunteered for the Y at Waterfest the past two years. Shortly before 2016’s EAA AirVenture, Mark was diagnosed with bladder cancer. After undergoing two surgeries, one during the week of EAA, Mark revealed his unwavering commitment to his volunteer role. His dedication to our organization, and the community, is truly remarkable. Aside from volunteering his time, Mark is a very active runner having completed several races in just over two years. Mark began his running career at the age of 60. He was inspired to start running by his daughter Jill, who took up the sport after being challenged by a coworker to run a full marathon to raise money for the American Cancer Society. 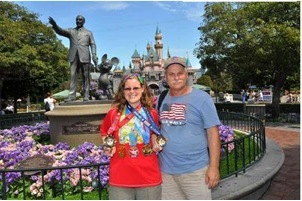 Since then, Mark’s daughter has raced many half marathons, marathons, 10 milers, 15Ks, 10Ks, and 5Ks. Mark and his wife attended as many races as possible to support their daughter. 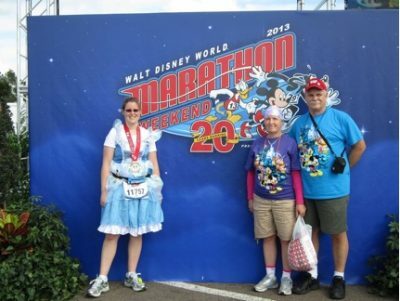 In January 2013, they went to the Walt Disney World Marathon Weekend to cheer on Jill for the full marathon. At this event, there was registration for the Disneyland Inaugural Dumbo Double Dare (10K and half marathon), which would take place over Labor Day weekend. The 10K theme was to be Alice in Wonderland; Alice is Jill’s favorite Disney character. Mark’s wife encouraged Jill to register for the Dumbo Double Dare because she had so much fun at Marathon Weekend. It was only four months later that Mark’s wife passed away. One week before her passing, she told Jill that she was not going to make the races but would send pixie dust from heaven to make Jill fly through the race. That Labor Day weekend, Mark went to Disneyland with a tear in his eye and a heavy heart. He picked his three spots on the course to cheer for Jill but quickly acknowledged that it wasn’t the same cheering alone. After the race, Mark asked his daughter if he could run any races. She told him he could do it; that he would have to start with shorter races and work up to longer ones. In May 2014, Mark ran his first race ever. 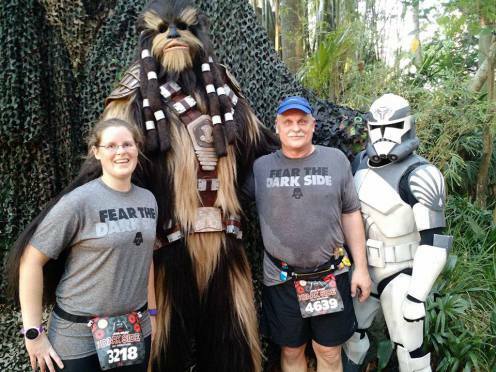 He completed the Expedition Everest Challenge 5K at Walt Disney World's Animal Kingdom. 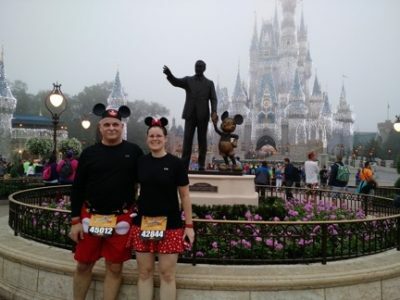 He loved it so much that he decided to sign himself up for his first 10K at the Walt Disney World Marathon Weekend to be held in January 2015. Mark was instantly hooked on Disney races and was soon ready for his first half marathon, the Disneyland Half Marathon also in 2015. 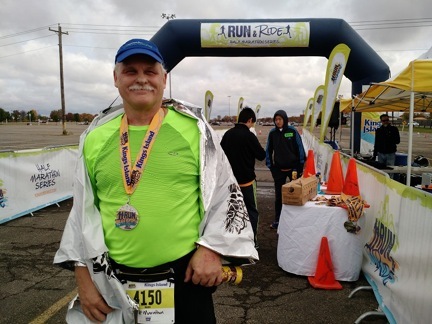 As of today, Mark has ran in eleven races; three 5Ks, one 10K, and seven half marathons. He has traveled to Florida, California and Ohio. Despite Mark’s recent diagnosis and operations, he has no plans of giving up. He’s already gotten back to running and is currently training for the Dumbo Challenge at Disneyland to take place over Labor Day weekend. 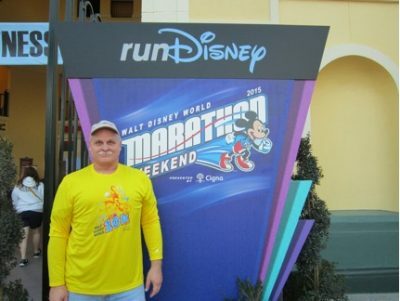 This September, Mark will be participating in the Inaugural Disneyland Paris Half Marathon Weekend. On September 23rd, he will race a 5K and on September 24th, he will run in the half marathon. Next up, he’ll be racing a half marathon in Cincinnati, Ohio come October. 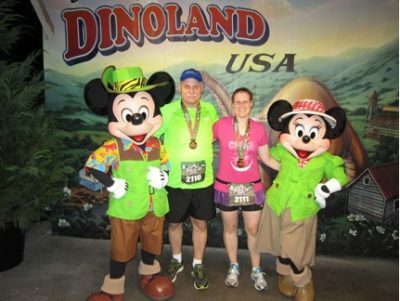 On his bucket list is to complete the Walt Disney World Marathon, in which you earn a Mickey Mouse medal. Mark would love to add that one to his collection. His favorite race, so far, has been his first half marathon at Disneyland during Labor Day weekend in 2015. It was a “dream come true” to run in the kingdom and behind scenes. He’s had some entertaining costumes in his running career, dressing up as both Mickey Mouse and Sully but his favorite thing about running races is the time he gets to spend with his daughter. Although Mark’s medals remind him of his accomplishments, he loves that they bring back exciting memories shared with Jill. Mark uses the Oshkosh YMCA on a regular basis to train for his marathon running. Complimenting his running regimen, Mark does Water Yoga and Power Current. These are two of his favorite classes that the Y offers.